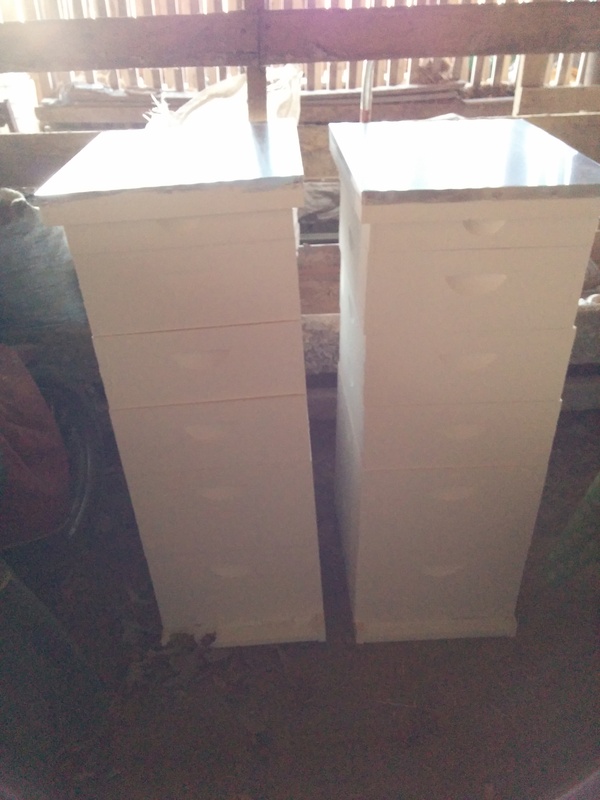 Update from the farm: Painted bee hives and ready for pigs! With winter reemerging today I decided to take a few days away from the farm. Lots of photos need capturing and detailed blog posts written, but here is what I have on hand. Beehives are finished with two coats of exterior paint. Here is my post on the process of painting the beehives with some tips (I also added this picture to that post). Only 5 days until I pick up my two colonies! Not pictured is the automatic hog waterer that I built, and had to rebuild after it failed to deliver enough pressure to gravity feed the water tray. I’ll take some pictures to provide a tutorial on that project next time I am at the farm. Also not pictured in detail is the shelter I flung together. It is not a shelter to be proud of, but should serve the piggies fine until I build something more permanent. I found an old cast iron legged, 4x4x4 foot cage thing in the barn. 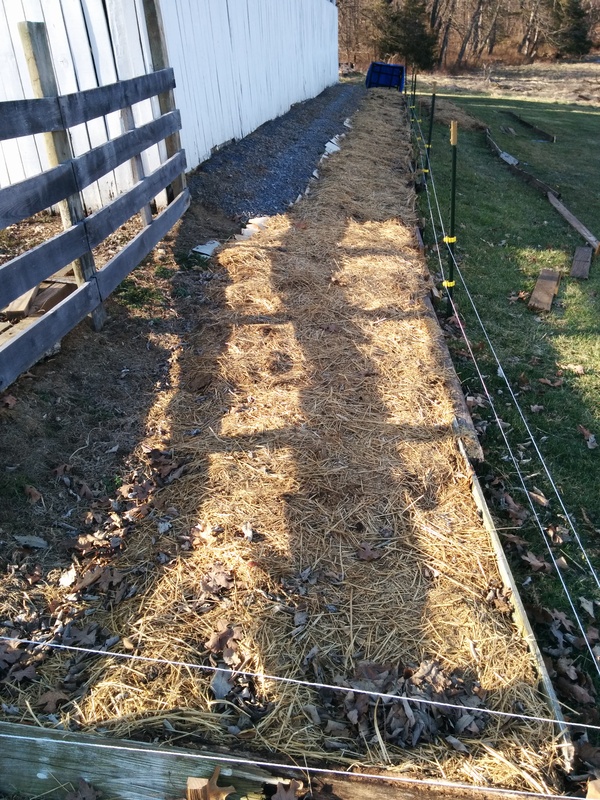 Zip tying a few $1 5×3 foot tarps to its exteriors will provide the windbreak and shade the pigs require. That is at the far end of the garden bed in the picture. As you can see, the remaining beds desperately need their filling of compost. That will be a priority in the next week or two so I can plant the blueberries, etc. Luckily I can slack on one of the beds as I ordered 54 heirloom sweet potato slips that won’t arrive until June. Even if I don’t get a fully mature crop, I will at least be able to harvest enough small potatoes to make slips for the following seasons where they will get a full season to mature, as well as grow some in containers over the winter. I also painted all of the wood surfaces at the bottom of the brooder in the ugliest color imaginable. Imagine clay grey-blue mixed with infant diaper deposits. Luckily it will be buried under deep bedding and the outside will be covered in corrugated metal. Finally, I bought all of the gutters for the back side of the barn which is only 8 feet off of the ground. When I install them, the 300 gallon tanks at either corner can begin to fill up. That reminds me, the 55 gallon plastic drum from which I made the hog waterer had previously housed some food-safe but non organic dairy defoamer. Extensive scrubbing via toilet brush and flushing with rainwater has removed every trace of it. Still I will be more selective in the future! Along these lines, a symphony of sounds and spectacle of violently exploding bubbles were created by flushing the residual 35% medical grade hydrogen peroxide out of the 300 gallon tanks that are repurposed as mini-cisterns. It was quite a site and assures that the tanks are sterile!